This breezy top or dress is a great project for the beginner or the more experienced sewist looking for a quick warm-weather sew! The Bianca pattern features a notched neckline and a flattering gathered waist in six sizes (XS–XXL) and two lengths (top or dress). Variations include a choice of elastic casing or shirring at the waist, options for either closed side seams or side vents, and tips for sewing your Bianca with contrasting facings on the outside of the garment (as in the photo below). A section on simple pattern adjustments will help you to achieve the perfect customized fit! The instructions and diagrams are thorough, easy to follow, and full of hints and tips. We’ve also included a 1-page summary of the instructions, or “cheat sheet” if you will, so you don’t need to print out the entire pattern, and a special “Seam Finishes Appendix” with instructions for my favorite seam finishes so your Bianca will be beautiful both inside and out! This pattern comes in a range of six women’s sizes, from XS through XXL. Refer to the charts below to find your size. Woven or knit fabric (see recommendations and yardage chart below). Recommended woven fabrics: lightweight cotton and linen blends such as voile, rayon challis, shot cotton, shirting, double gauze, lawn, and broadcloth. Bianca is especially flattering when made with fabrics that have a nice drape! You may want to check out my post on garment fabrics here. You’ll find a helpful shirring tutorial HERE. 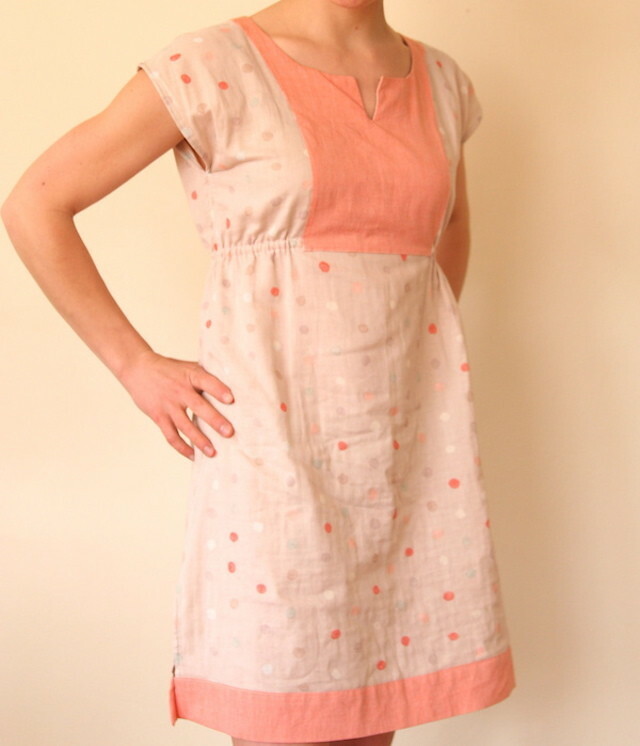 Pink Voile Tunic, for me was a precursor to Bianca, way back from 2011! It has similar construction, but the neckline is different, and the drawstrings have been replaced by elastic in Bianca. Rae’s Spring Top: Liberty Tunic with Ties is another precursor to Bianca. This top is slightly longer than the current pattern, it has a contrast outer facing, and it has ties instead of elastic or shirring. I’d love to see what people are making with the Bianca Pattern! Please post pictures of your finished Bianca Tops and Dresses to the Bianca Sewing Pattern Pool on Flickr! I enjoy her really much! Thanks for your work! This is such a beautiful dress. I’ve been following you for a while now. All your patterns are amazing! I SUPER love this pattern. You are such a talent. Yay! I am so happy with your patterns, Rae. You put a lot into them and it shows through the quality: the patterns are clean, crisp, easy to follow, and meticulously plotted out. They are just the right amount of explanation for an adventurous beginner like me, and puts it all into my grasp for ease-of-construction and delight in making it all come together. Thanks for all of your hard work and attention to the finest detail. Personally, I think you’re a notch above even more highly reputed fabric designers. I prefer your patterns to some of theirs, quite frankly. You know the way sewists think! MWA! Hey, are Fanfare flannels back in stock yet anywhere that you might know of? Great pattern!! I just took a quick trip through the flicker spring top sewing. What a treat to see everyone all dressed for warm weather. It is such a great blogging event every year. One year I will make one, too. Maybe next year. So excited!! I’ve been hoping for this pattern since the original pre-cursor. I’m a bit perplexed by the bust measurements, is there really that much ease/design for 7+ inches? Help me understand please!